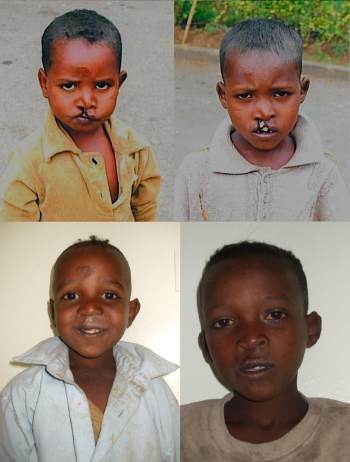 Project Harar arranges treatment for children with facial disabilities in rural eastern Ethiopia. There are few roads, fewer buses and just one doctor for every 70,000 people. For brothers like Obsa and Numibian (pictured), getting treatment for their cleft lip and palate was almost impossible. Living some 500 kilometres away from the capital, Addis Ababa, reaching the medical care they needed costs more than a coffee farmer earns in a year. That’s where Project Harar comes in. The charity's dedicated Ethiopian team travels to remote villages, raising awareness of the free treatment available and making logistical arrangements with families and surgeons. The treatment is provided by local medics – ensuring that we utilise local hospitals efficiently, and do not displace it. Project Harar's Director in Ethiopia, Sebsibe Ayele, sends us before and after photos for every patient, ensuring that we monitor the difference that the Barbara Ward Children's Foundation and other generous donors are making on the ground. In 2008 Obsa and Nuredin travelled together to get surgery for their cleft lip and in 2010 they returned to get treatment for their cleft palate. One in 600 children are born with cleft lip/ palate, and many others acquire injuries and illness including burns, hyena bites and noma - a devastating disease of poverty. Apart from daily communication and physical difficulties, many individuals with a facial 'difference' are ostracised by their communities: most of our young patients were previously denied their right to a school-place and in some cases were abandoned to become street-children. It's fantastic to see them looking so well - their cleft lip is virtually undetectable, a tribute to the skill of the Ethiopian surgeons. The brothers' treatment is also a sign of wider change in the Ethiopian health system. Until very recently, there were almost no options for children with a cleft palate and they suffered daily difficulties eating and speaking. But now more and more children like Obsa and Nuredin can get the full care they need to eat, speak and smile like every other child. The help of the Barbara Ward Children’s Foundation and others has been essential in allowing Project Harar to offer better treatment to more children, living even further away. They reached 575 young patients last year, and plan to reach even more in 2011.